The last weekend in May is always a special one for me, not it only is it a three day weekend thanks to the bank holiday, but it also usually falls on my birthday. Given these two factors it’s also a time of year that I usually plan a holiday; I’m not a massive birthday person so getting away for a few days is my way of treating myself. Last year was a big trip to the USA and Canada and this year was 4 days in my favourite city of Paris (lots more about this in upcoming posts). This year I also decided to add some running into the birthday plans and start off my new year on the right foot (so to speak). The timing was perfect as the late May bank holiday weekend is also when Vitality hold two of their signature races – the Westminster Mile on the 27th and the London 10,000 on the 28th. Given that I was coming back from Paris on the 26th I quickly booked places on both events. Now the first thing I should say is that running these two events back to back after having just come back from four days of pure indulgence (and the inevitable weight gain), coupled with the high temperatures probably wasn’t my best idea, especially for the 10km on the Monday. But before we get to that let’s start with the Westminster Mile. When I booked this I had very little idea of what to expect, I’d never run this distance at an organised event and so planned to treat this as a bit of a fitness test and set a benchmark for the distance. I have to say I was really impressed with the race – it had a great family atmosphere and everyone seemed to be having a lot of fun. For me I was pretty happy with how I went. I guessed that I’d be aiming at around the 10 minute mark, and came in at just a few seconds over 9. So time wise I was really pleased – especially when I realised it was the fastest mile i’ve ever run. 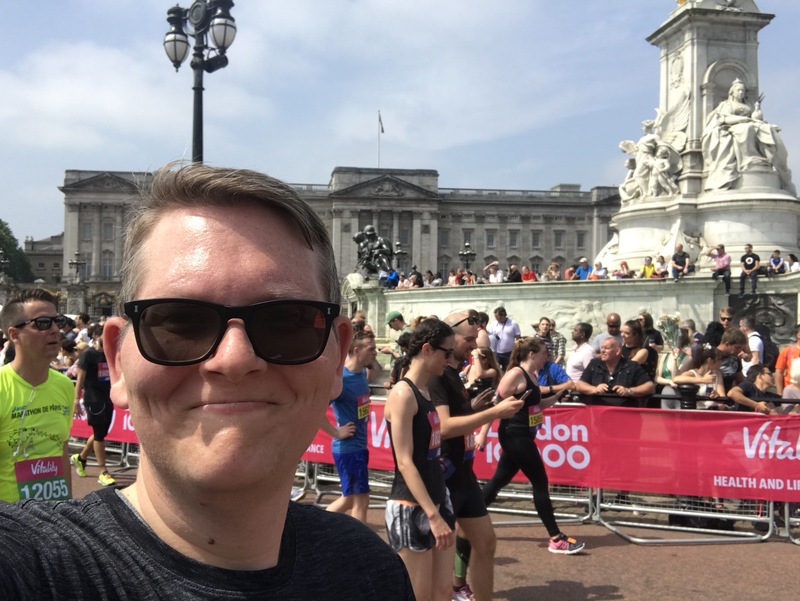 The race starts off half way up the Mall, turns right to pass Horseguards Parade before looping back onto Birdcage Walk and finishing back in front of Buckingham Palace. So as far as routes go you probably can’t beat it. Plus the medal you get is also brilliant, which considering the entrance fee of £8 was really impressive. This is definitely going to be a regular feature in my running calendar going forward. That said I could tell as I ran than I was possibly in for a difficult time the next day for the 10km. My legs felt sluggish and I just wasn’t running the way I wanted. I guess the 80km I ran/walked the previous four days in Paris were taking their toll. So the next day I turned up nice and early feeling a little apprehensive. I’d wanted to improve on my 10km time for this event and was hoping that I could run in 1:05. Given that my last two 10km races (both with RunThrough) were at 1:06 this felt like it should be achievable. As with the Westminster Mile the London 10,000 was really well organised with the separate waves moving off relatively quickly and doing a decent job of managing congestion. Compared with the London Winter Run which follows basically the same route I never really felt like I might be bumping into other runners. Having run in the Winter Run I also knew I should enjoy the route and I really did. There’s something quite special about running on closed roads around my city, especially when your running past all the sites. These last three km definitely gave me a more respectable time than I thought might happen, coming in at 1:09:05. But I know I can do better and feel like I’ve got some unfinished business with this race. So I’ve made myself a deal. I’m going to come back next year and I’ll be finishing in under an hour! As with the Mile event the 10km comes with a great medal (one of my favourites so far) and a great finishers t-shirt. I picked up a Large which was annoyingly a bit too small for me, but I’ll just use that as a bit of motivation to lose a bit more weight that I want to shift. The other nice part of the day was that after I finished and was walking through the event village back to the tube station Dame Jessica Ennis-Hill was giving a talk so I stopped to listen and then managed to get a selfie with her! Great to end the weekend meeting such an amazing athlete. All in all, even with my disappointing time, this was a really great weekend of running with two really fantastic events. I can’t wait to come back in 2019.